The Israel museum has announced that it will display the "Gabriel Stone." The "stone" is a tablet inscribed in ancient Hebrew that describes a vision of an attack on Jerusalem during which God appears with angels and rescues the city. Leading the angels, or at least acting as the central character, is the angel Gabriel. The stone was found in Jordan thirteen years ago and scholars are still debating what it means. In 2008 one scholar suggested that a line which reads "after three days you will live" was a reference to resurrection. Some pounced on this interpretation and suggested that it was proof that the Christian story of Jesus rising from the dead after three days was borrowed. Since 2008, however, that interpretation has been shown to be wanting. One major problem is that the lines on the stone have faded and there are cracks in the stone both of which makes it difficult to decipher. What the stone does demonstrate, however, is a high-level of interest, if not preoccupation with, angels in the second temple period. While angels appear infrequently in Hebrew Bible, they are mentioned numerous times in the New Testament and other Jewish and Christian literature of the time. Here is some of what the article has to say. 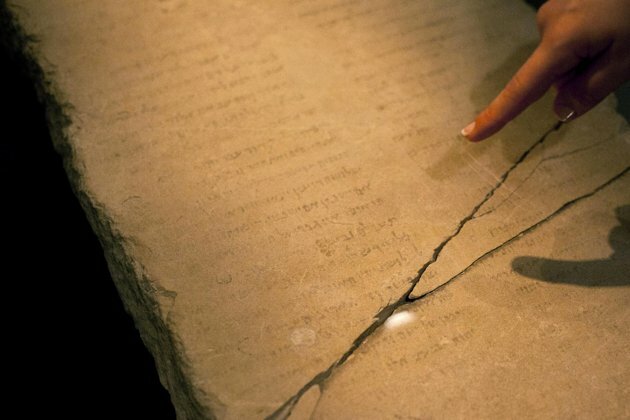 Bible experts are still debating the writing's meaning, largely because much of the ink has eroded in crucial spots in the passage and the tablet has two diagonal cracks the slice the text into three pieces. Museum curators say only 40 percent of the 87 lines are legible, many of those only barely. The interpretation of the text featured in the Israel Museum's exhibit is just one of five readings put forth by scholars. All agree that the passage describes an apocalyptic vision of an attack on Jerusalem in which God appears with angels on chariots to save the city. The central angelic character is Gabriel, the first angel to appear in the Hebrew Bible. "I am Gabriel," the writing declares. The stone inscription is one of the oldest passages featuring the archangel, and represents an "explosion of angels in Second Temple Judaism," at a time of great spiritual angst for Jews in Jerusalem looking for divine connection, said Adolfo Roitman, a curator of the exhibit. The exhibit traces the development of the archangel Gabriel in the three monotheistic religions, displaying a Dead Sea Scroll fragment which mentions the angel's name; the 13th century Damascus Codex, one of the oldest illustrated manuscripts of the complete Hebrew Bible; a 10th century New Testament manuscript from Brittany, in which Gabriel predicts the birth of John the Baptist and appears to the Virgin Mary; and an Iranian Quran manuscript dated to the 15th or 16th century, in which the angel, called Jibril in Arabic, reveals the word of God to the prophet Mohammad. "Gabriel is not archaeology. He is still relevant for millions of people on earth who believe that angels are heavenly beings on earth," said Roitman. The Gabriel Stone, he said, is "the starting point of an ongoing tradition that still is relevant today." So, as usual, what we have here is not a bombshell archaeological discovery, but rather another piece of evidence that helps us to better understand the world of the New Testament. Some have suggested that the stone may in fact be a "practice stone" for teaching the copying of texts. See the article here. Read the story on the stone here and here. I don't usually copy wholesale content from someone else's blog. 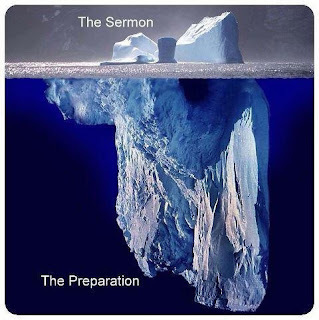 But over at the Parson's Patch Mark Stevens has some great thoughts on sermon preparation. For those who have ever sat under a teacher who puts in the time and effort to produce an intelligent, challenging, quality sermon, this is the kind of time and effort it takes. Pastors don't simply work one or two days a week. In addition to the hard work of preparing for the Sunday message there is all of the other "stuff" of church life like funerals, weddings, family crises and community service. "I’m not sure how others do it but this way works for me. The picture tells the story! Mine take around 20 hours to prepare. I preach for about 25 minutes. Some say it seems like 20 hour! I usually start with the Greek or Hebrew text and check it alongside technical commentaries. Then I exegete the text and come up with a rough outline. from there I let it percolated or a few days. I may write some stuff I read the other commentaries (5 or 6 usually). By Thursday the aim is to have a rough draft. Friday morning I re-edit what I have. Depending on the pastoral load this will happen on Saturday. Sunday morning it gets a final run through and re-edit. I never practice a sermon (that is what editing is for). Why do I do this? because its Scripture and God’s word matters as much as his people do. If you wonder when I pray, it is throughout the entire process but more fervently as Sunday approaches! I’ve never heard anyone regret their pastor taking a long time to prepare but I’ve heard plenty complain when their’s doesn’t prepare enough!"